This post has been sponsored by Bertolli® Olive Oil. All thoughts and opinions are my own. 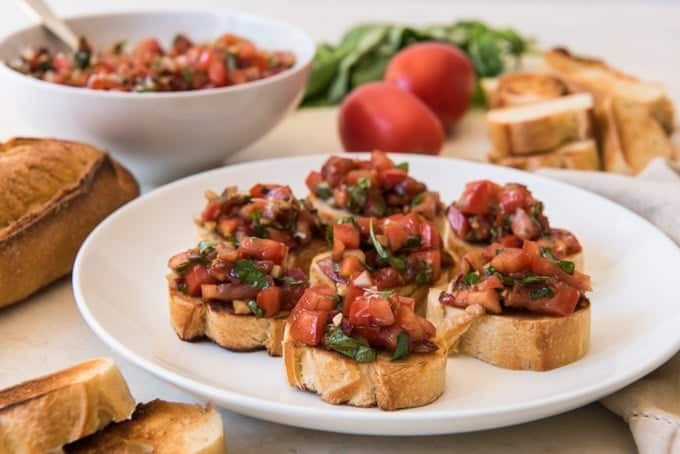 This classic bruschetta recipe uses fresh roma tomatoes, basil, garlic, a little balsamic vinegar, and Bertolli® Extra Virgin Olive Oil to top slices of toasted baguette. 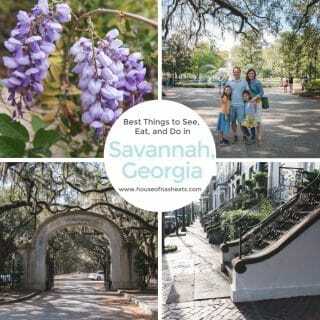 It’s easy, fresh, and makes a wonderful appetizer for any party or gathering! With something as simple and classic as a tomato basil bruschetta, the quality and flavor of the olive oil really makes a difference! 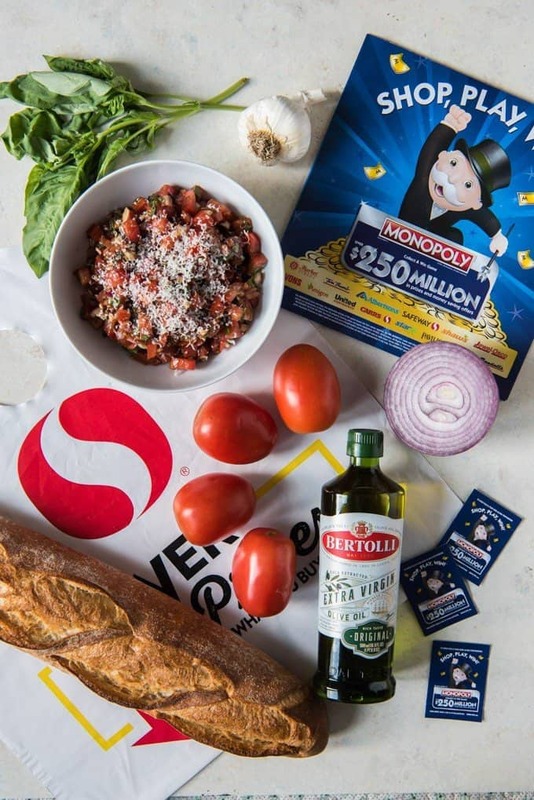 When you buy any Bertolli® Olive Oil at Safeway or Albertsons during the 2018 Monopoly program, you will receive extra game pieces to place on your Monopoly board. Which means more chances to win prizes! 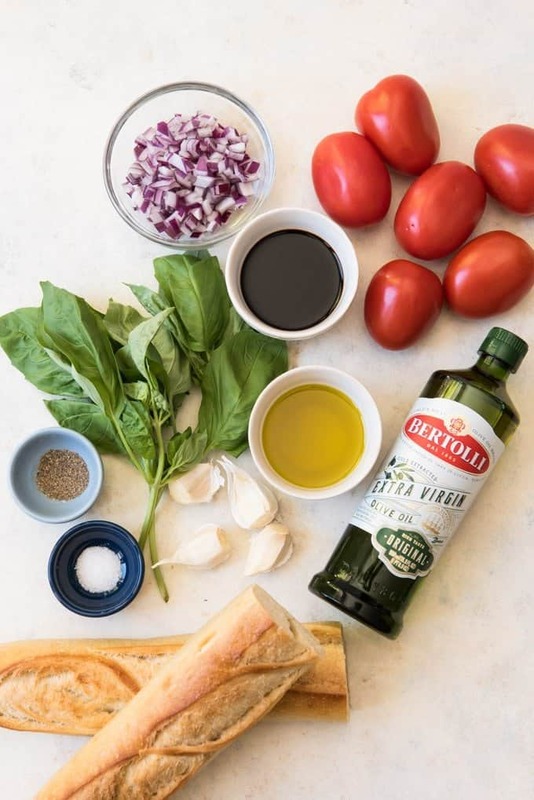 I love Bertolli products and especially Bertolli® Olive Oil. 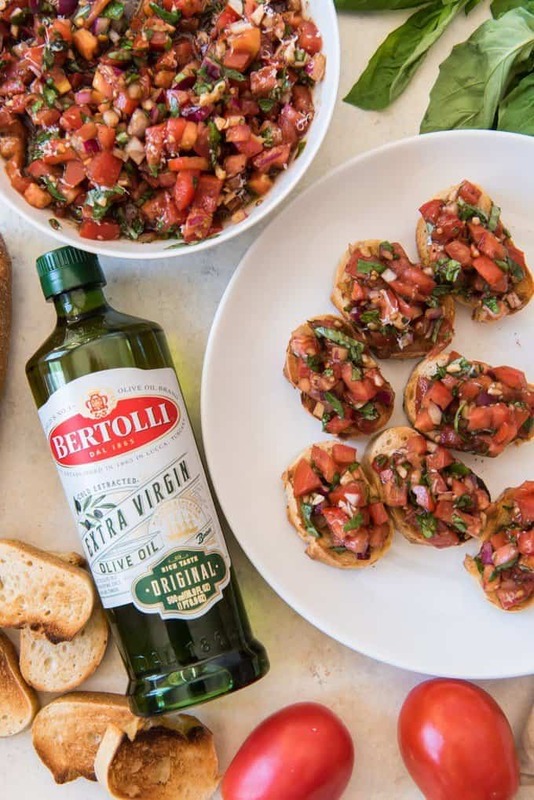 When the recipe is simple, like this classic bruschetta, it’s super important to use good olive oil like Bertolli® Extra Virgin Olive Oil. 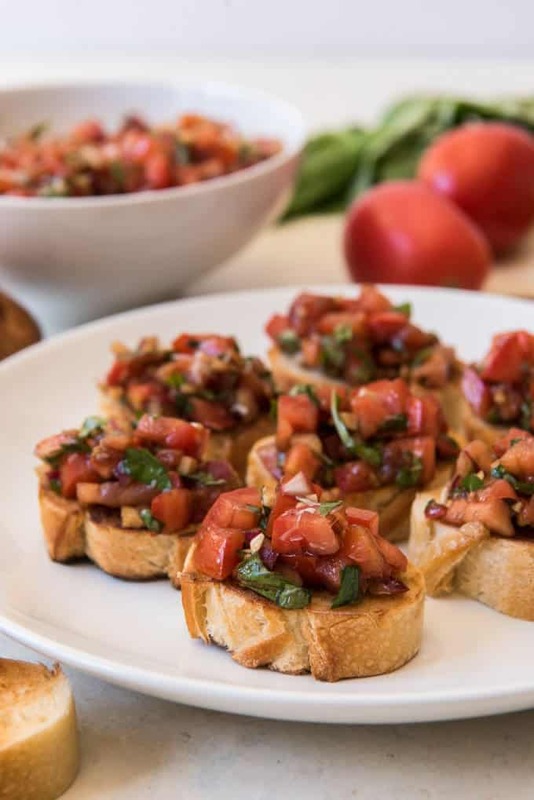 Bruschetta is a classic Italian appetizer (also known as antipasto or a starter dish) that is traditionally made from grilled bread that gets rubbed with garlic and drizzled with good olive oil, then served with toppings that can vary widely, but are very often a tomato basil salad. Also, it’s pronounced “broo-sketta”, not “broo-schetta”. It’s a commonly mispronounced word in America, but in Italian, the ‘ch’ letters are pronounced like a ‘K’. Learn something new everyday, right? What is the best bread to use for bruschetta? It might sound strange to use a French baguette in an Italian bruschetta recipe, but it really is the best bread to use for bruschetta, in my opinion. A rustic country bread works too. Just make sure it’s a bread that has a soft interior with a crusty exterior. If you want smaller bruschetta, just cut the baguette straight into rounds. Or if you would like larger portions, slice the baguette on the diagonal for more surface area so that each slice can hold more of the bruschetta topping. To make bruschetta, it’s as simple as combining all of the ingredients for the tomato basil topping in a bowl, then using that to top individually toasted slices of bread. 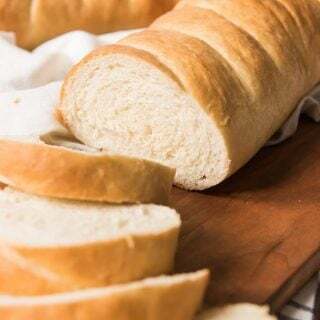 Arrange each piece of bread on a baking sheet and toast in the oven until lightly browned, then rub each piece of toast with a clove of garlic and drizzle or brush it with a little olive oil. If the weather is nice and you have a grill, then by all means go ahead and grill your bread. Although I honestly just find it easiest to toast the bread in the oven rather than man the grill for this dish. Serve the toasted bread with the topping on the side and let everybody top their own, or mound some of the tomato basil salad over the top of each piece of toast if planning to serve immediately. Since there are so many variations of bruschetta, you could alter the salad and make bruschetta with mozzarella if you want something slightly more slightly more substantial. 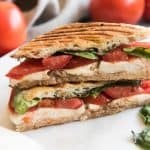 It’s similar to this grilled caprese panini that is one of my favorite lunches of all time. 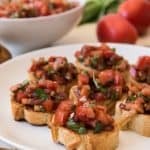 But I really feel like the best bruschetta recipe is the one that is simple and lets the classic flavors of tomato, basil, garlic, and olive oil shine. 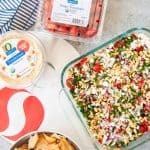 You can get all of those ingredients at Safeway and whip up this appetizer in no-time for entertaining or just for a light lunch. 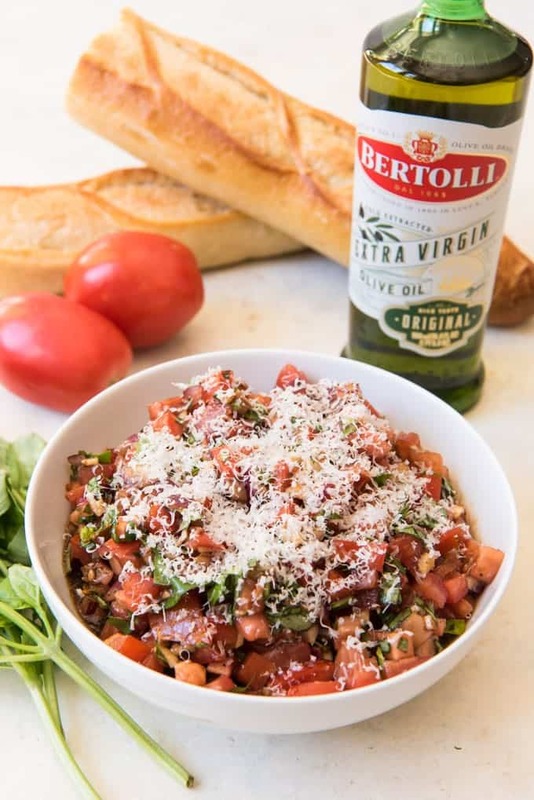 Find more recipes featuring Bertolli® Extra Virgin Olive Oil here! This would be wonderful served with fettuccine in a roasted red pepper sauce. 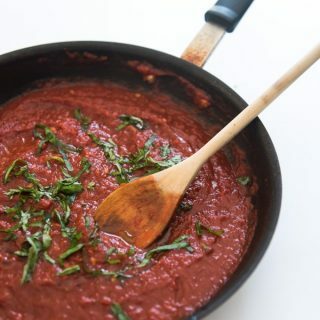 Combine the diced tomatoes, red onion, garlic, basil, olive oil, balsamic vinegar, salt, and pepper together in a large bowl. Sprinkle with the Parmesan, if desired. Heat a broiler or grill to high heat, then toast the baguette slices on each side until lightly browned. Serve together for guests to top their toasts individually so they don't get soggy, or top each toast with the tomato mixture and serve immediately. If desired, make a balsamic reduction to drizzle over the top of each bruschetta by bringing the balsamic vinegar to a boil over medium heat in a small saucepan, then reducing the heat to medium-low until the liquid has reduced by half, about 5 minutes. Remove from heat and allow the balsamic vinegar to cool before drizzling over the bruschetta. The reduction will continue to thicken as it cools. Honestly I don’t even want to think how much olive oil I go through. I should have shares in a company. Homemade bruschetta is so easy and delicious. The prefect app for dinner any night of the week. The perfect way to get the party started too. Bruschetta is so good! I love it in the summer with fresh tomatoes and basil from the garden! 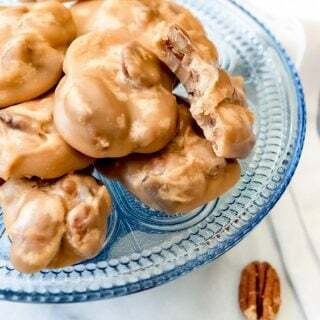 Although having it other times of the year it’s still tasty and reminds me of warmer weather. What a wonderful appetizer! 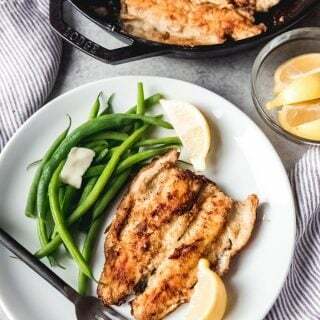 I always love it in the summer, with all the fresh product, it just can’t be beat! 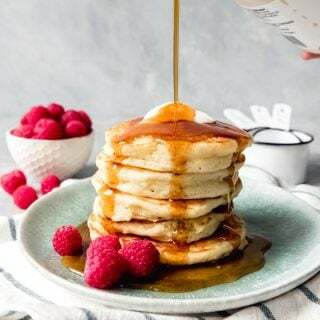 How delicious and tasty! I could not survive in a world without olive oil! No way! This bruschetta looks amazing and easy to make. 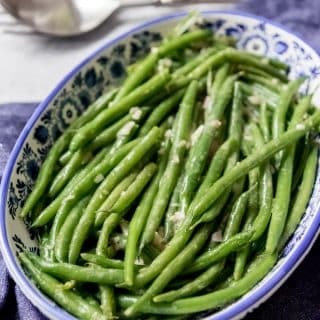 One of those appetizers everyone always loves! I’ve had the pleasure of eating baguettes in both France and Italy. The Italian baguettes are just like American French baguettes so you are spot on using French bread here in the States for bruschetta. 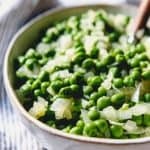 I love this recipe and I agree, the olive oil is everything! Thanks for that insight! That’s super helpful to know! I love tomato bruschetta and can’t wait for this summer so I can make some fresh from the garden. This recipe looks scrumptious! I love Bertolli products! They have such a great reputation for quality. This bruschetta looks so classic, and perfect as we’re heading into prime tomato season. 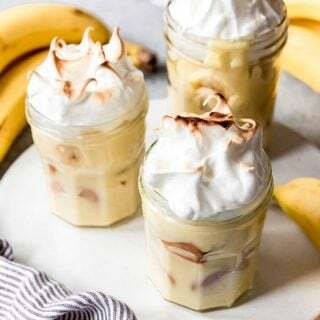 I’ll be serving this one all summer for al fresco entertaining!